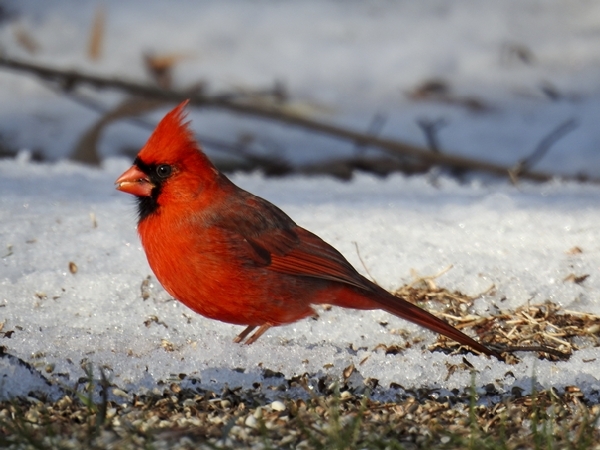 It’s hard not to like Northern Cardinals. 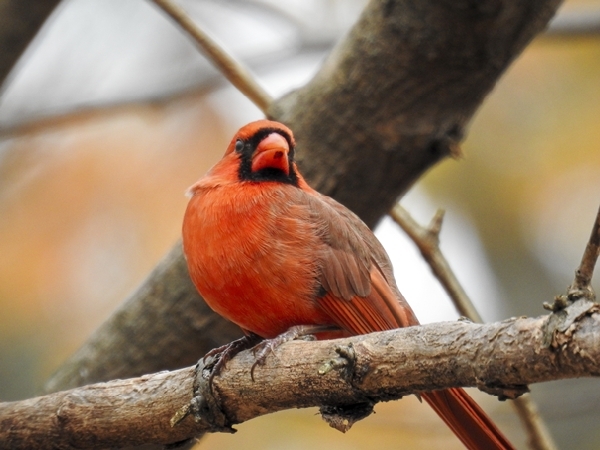 One of our most popular feeder birds, the male’s beautiful red color pops in the yard, especially in the dull grey winter months of the year and the female’s more subtle orange and red tones are lovely as well. They come to our feeders fairly readily and are polite guests. They might bicker with each other a little bit, especially in the spring when territory becomes an issue, but they don’t give other species a hard time. If you live within their range, attracting them to feeders usually isn’t hard to do. 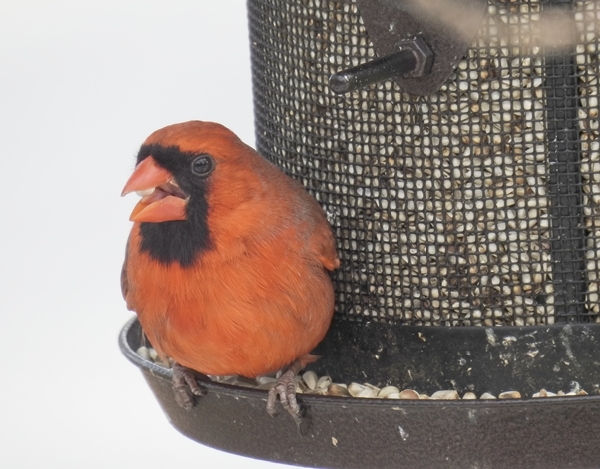 Many people will tell you that you should offer sunflower seed to attract Northern Cardinals and I imagine that would definitely work; it’s a seed that they do eat readily. But in my yard, the seed they seem to crave is safflower. Given a choice, they go for the feeders with safflower over sunflower. They will also eat millet. 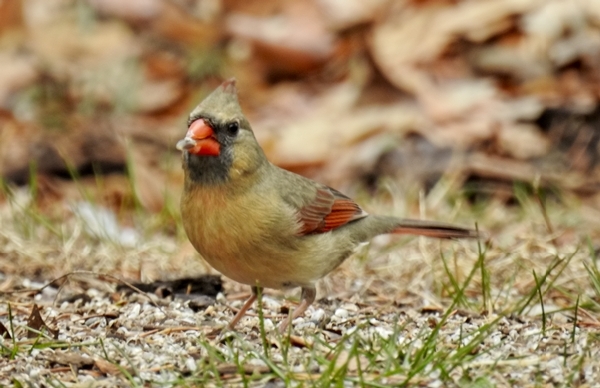 Safflower is not a seed that all bird species’ beaks can handle or that all birds like, so it isn’t the only seed you’d want to offer to attract a wide mix of birds, but if you want cardinals, give it a try in one feeder and see what happens. It also has the nice advantage that some of the birds that we less often like at the feeders aren’t fans of it. Northern Cardinals are by nature ground feeding birds and the ones in my yard will often pick up spilled seed off the ground. But they will also accept seed from feeders where the seed is easier to keep clean and dry. I have a lot of feeders in my yard of various types. 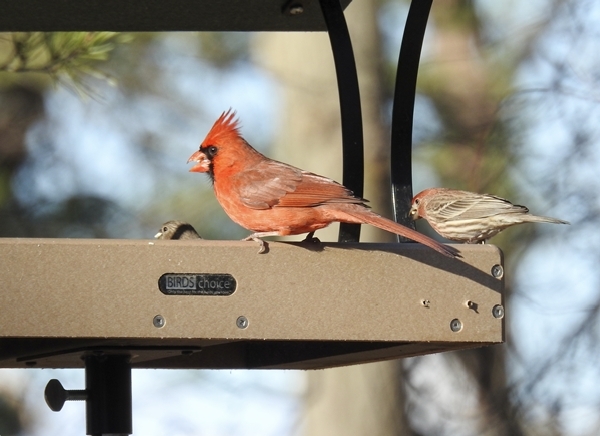 The cardinals seem to strongly prefer platform feeders. Their favorite feeder is a Birds Choice platform feeder mounted on a pole. The second favorites are two Birds Choice platform feeders hanging from a shepherd’s hook pole. These three feeders, when filled with safflower, are always their first choice. They will also eat at the two hopper style feeders, but they usually choose the hoppers when the platform feeders are dominated by other birds. The cardinals in my yard don’t seem to be fans of tube feeders. I’ve read that cardinals don’t like to sit sideways toward a feeder port and that is how the perches on most tube feeders tend to work. 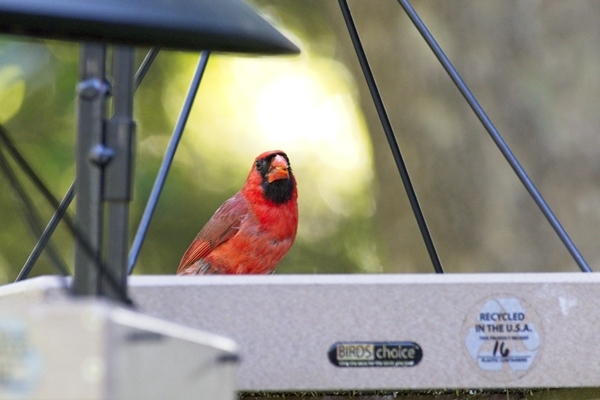 The two Squirrel-Buster Plus feeders I have include “cardinal rings” that allow birds to face the feeder. Interestingly though, in the years that I’ve had these feeders, I’ve only seen cardinals on them once or twice, regardless of whether I put safflower or sunflower hearts in them. (I usually fill them with sunflower hearts.) They seem to be willing to wait for the platform feeders to be free rather than use these feeders. It’s very possible that if these were the only feeders available, that they would use them. I think there are enough other feeders that they like better that they don’t feel the need to use these. BUT, there is one tube feeder that is very popular. It is a monster sized Garden Treasures metal mesh tube feeder that I got from the local hardware store years ago. The perches require them to sit sideways but that doesn’t seem to bother them. They hang out at this feeder all day long. I honestly don’t know why they like this one, but not other tube feeders. The ports and perch length are about the same size, although the metal mesh feeder’s perches are a little closer to the level of the ports and there is a little lip at the bottom that catches spilled seed where they like to sit and eat. 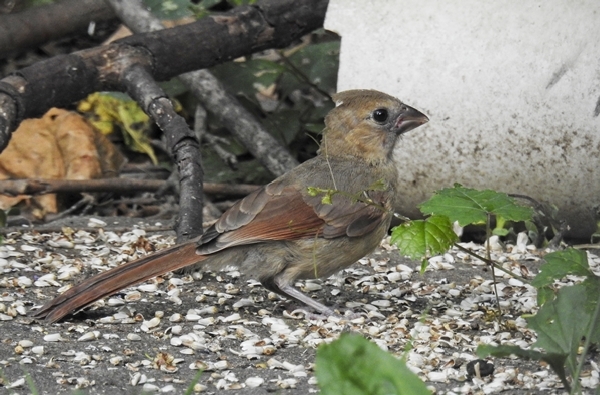 It is in the front yard which has fewer feeders and so is usually a bit less busy so that might be part of it. Water is also important to offer birds. I have several birdbaths available all year round. If you are going to offer water, it is important to keep the water clean so you need to be willing to keep an eye on it and change the water at least every few days. In the winter, I heat two of my birdbaths, one with a birdbath heater and for the other, I swap out the bowl for a heated one. Northern Cardinals, like most feeder birds, appreciate having cover somewhere near the feeder. When they arrive at the platform feeder area, they typically stop to land on a tree or bush or vine ten to fifteen feet from the feeder, check out the area and only then go over to the feeder. The metal mesh feeder on the other hand, hangs from a tree branch. 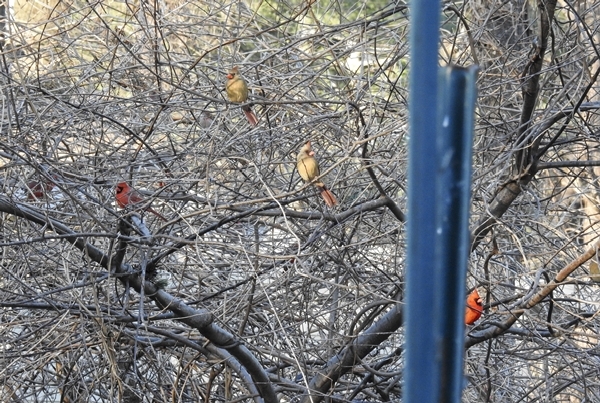 The cardinals can fly to a branch a little higher in the tree, check things out and then drop down to the feeder. Having a tree or shrubs at at a short distance from a feeder keeps it out of squirrel jumping range but gives the birds a chance to get out from the open when a predator arrives at the feeders. They tend to retreat to cover any time they are spooked and when more dominant birds push them out of the feeders. If the problem is just a busy feeder, they will wait, seemingly patiently, until the other birds move on and then they take their turn at the feeders. Cardinals also use dense shrubbery to nest in, although I doubt they would choose to nest right next to a busy feeder. (At least I’ve never seen that.) But if you have thick bushes elsewhere on your property, they just might decide to nest there and raise the next generation of cardinals. It’s fun to watch mom and dad cardinal bringing their brood of little ones to the feeders for the first time. 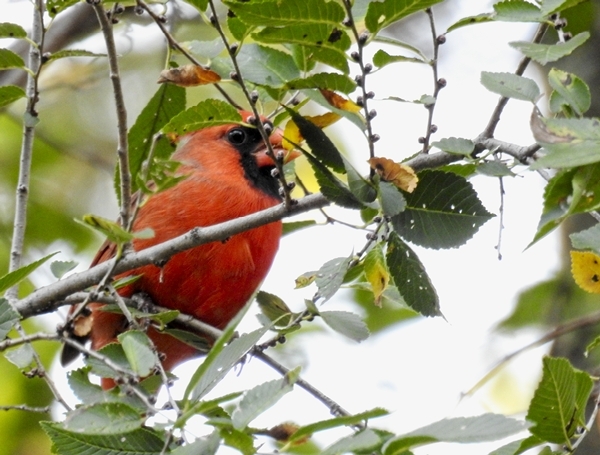 If you plan to plant trees or bushes, keep in mind that native plants support native bugs and insects and that too is a big part of what cardinals and other backyard birds eat, making your yard even more attractive to them. 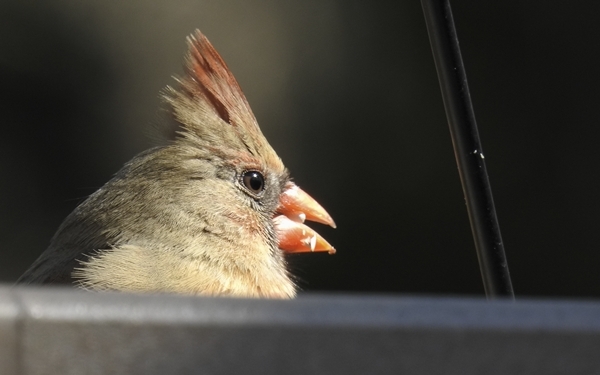 Cardinals are a joy to watch and not hard to attract. Just offer them foods they like in a welcoming environment and you are likely to have them visit your feeders. ← European Starlings: Messy Eaters!